We’ve just acquired a Franklin Library edition of T.S. Eliot’s Collected Poems – the book will be up for sale shortly, but do let us know beforehand if you’re interested in it. This edition of T.S. Eliot, like many Franklin Library books, is a fine binding, full-leather book with 22K gold gilt to all edges and on the cover. 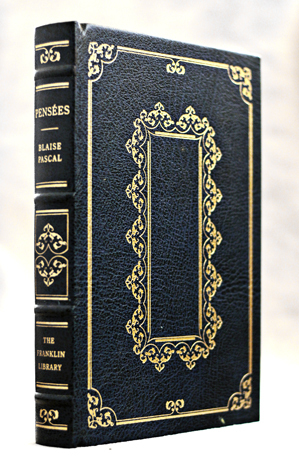 The Franklin Library is (was) one of the few publishers producing fine binding editions in this day and age. Almost all the books they published were reprints of literary classics (modern, ancient, and everything in between), and most of them were issued in the late 70s and early 80s. Unfortunately, following the sad fate of many other publishers, The Franklin Library closed down in the year 2000. As you can probably tell, The Franklin Library tried to revive the old world of antiquarian books, exhibiting an aesthetic not unlike fine-binding books of the late 1800s and early 1900s – with slight differences in accordance with our times. For this reason, many collectors question the purpose of getting these books – why buy a wannabe antiquarian book, when you can purchase an actual antiquarian book? But The Franklin Library has its fans, who love it for the simple reason that the books are beautiful and haven’t been scarred by the test of time. And they are also more affordable than the fine-binding antiquarian copies which have managed to preserve the brightness of covers/pages, solidity of binding, etc. For example, it’s difficult to acquire an antiquarian, fine-binding copy of any of Jane Austen’s works; chances are, you’ll have to fork out the equivalent of the average Singaporean’s monthly wage for it – or more. Another reason to collect Franklin Library books is the fact that they published two genres absent in the world of antiquarian books: modern classics, and translated works. Because antiquarian books are, well, antiquarian, you’ll never find a leather-bound, fine-binding old copy of modern classics. Unless they were sent to private printing presses, early editions of books by writers such as Hemingway, Faulkner, Steinbeck and their ilk were mostly mass produced hardcovers, similar to 1st edition copies of today’s books. And even these can cost a lot – a 1st edition copy of Hemingway’s The Old Man and the Sea in good condition, for example, can go for US$4500, which is a relatively small sum in the world of high-end rare books. So the only way to acquire a special copy, especially if you aren’t a millionaire, is to purchase modern collector’s editions by publishers like The Franklin Library, Easton Press, and a couple of others. But most modern presses, with the exception of The Franklin Library and Easton Press, do not try to replicate the “antiquarian look”. The same goes for translated works, especially translations of books written in non-Western European languages. Although there had been scattered translations of Eastern European (Russian, Czech, etc) and Asian (Chinese, Sanskrit, etc) works from as early as the 16th century, these weren’t common or easily available until the late 19th and early 20th century, when translated literature really started to take off. And so it’s difficult to find an antiquarian copy of, say, Dostoevsky in the English language, although it’s not impossible. Nevertheless, the most convenient way to acquire beautiful, antique-ish copies of translated works is by collecting a modern collector’s edition.